Auricular acupuncture is a non-verbal approach to healing that involves the gentle placement of up to five small, sterilized needles into specific sites in each ear. The recipients sit quietly and listen to soothing music while sitting in an anti-gravity lounge chair. The session lasts about 30 minutes. It is clinically effective, cost efficient, drug free, and compatible cross culturally. The combined use of acupuncture with counseling, education, medical support, and self help groups enhances opportunities for success. 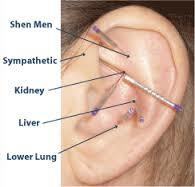 Also, addiction and trauma are being effectively treated with a simple ear acupuncture protocol. Administered in a group setting, or individually, this proves an effective treatment for pain reduction, smoking reduction, and stress management. This treatment is also being used nation-wide for Veterans and active-duty soldiers to help reduce anxiety, pain, flashbacks, insomnia, and hyper-vigilance. It is used for people with depression, anxiety, and PTSD symptoms. It is used as an engagement and retention tool in many health care clinics around the world, Treatment is provided by a National Acupuncture Detoxification Association (NADA) certified acupuncture detoxification specialist. How it's Done: Call Meadow Run Holistic Counseling for intake and schedule group or individual sessions. Price: Intake and Individual Sessions $45.00.